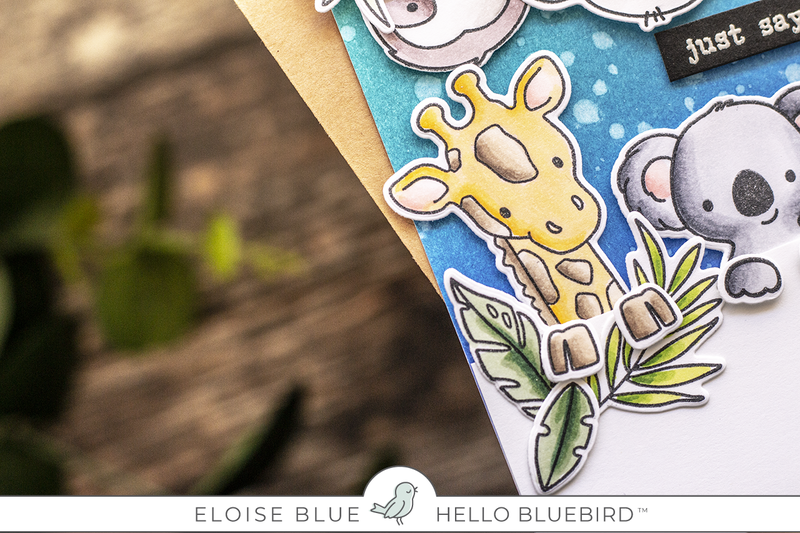 Hello friends, today is Day Four, the last day of the Preview Week for Hello Bluebird Stamps newest release. Tomorrow is the big day. 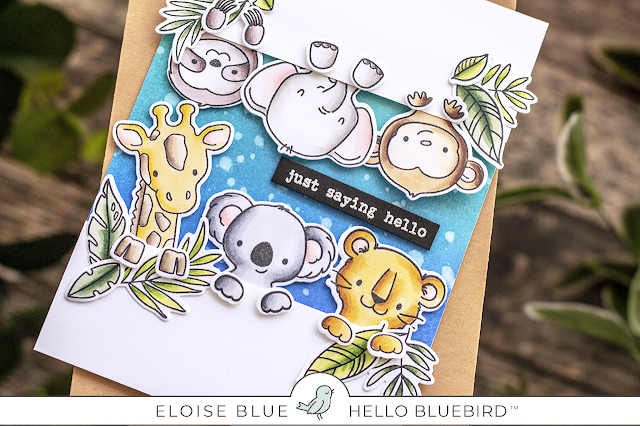 Today though we are showcasing Portrait Pals and Typed Everyday Stamp Sets along with Photo Stack and Hello Friend Dies. 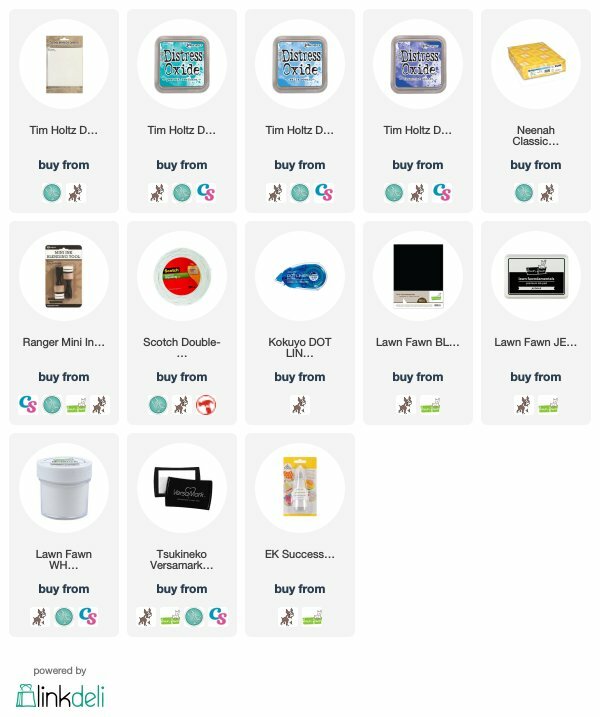 I'll just be using the Portrait Pals and Typed Everyday Stamp Sets but those dies work perfectly with this stamp set, too! 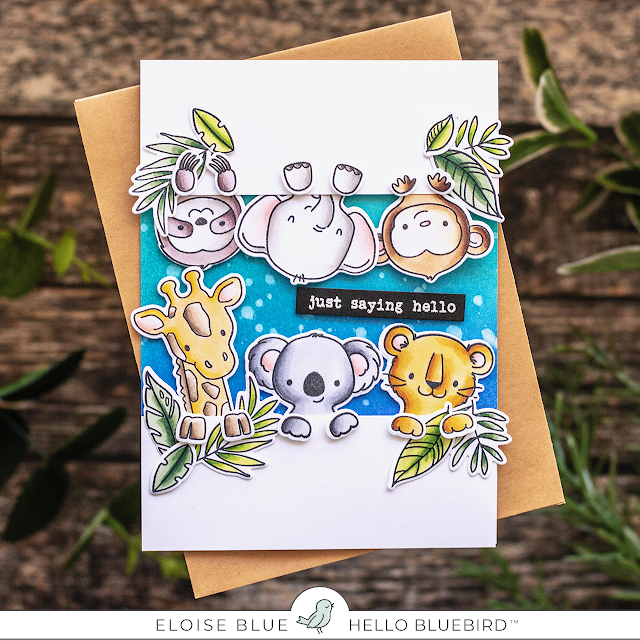 I started off with stamping out out my images with their coordinating feet and leaves and coloured them in with Copics. I then cut them out using all the coordinating dies. For the background, I used Peacock Feathers, Salty Ocean and Blueprint Sketch Distress Oxide Inks and ink blended these onto a piece of watercolour cardstock. I flicked on some water and dried it off with a heat tool. I then adhered my images onto the inside, three right side up and three upside down, making sure to leave enough room for the sentiment. I then cut down two pieces of white cardstock to 1 1/2" tall and 4" wide. I then added foam tape and adhered it onto the top and bottom of the card. I then added adhesive to the backs of the leaves and adhered them into place and added foam tape to the feet of each of the animals and adhered them accordingly too. Lastly I took the Typed Everyday stamp set and white heat embossed a sentiment onto some black cardstock. I adhered that into place to finish up. That finished up my card for today, I hope you enjoyed. Thanks so much for being here all week following along to see the brand new release. Remember the cards I've been sharing all week along with the other team members are apart of a release coming tomorrow. All items will be available to purchase and I'll also have a close up of the entire release in a video, so make sure you check back then!